A new composition by Wm. Glenn Osborne with lyrics by John Dalles will be premiered during the baccalaureate service of Gateway High School by the Bel Canto Choir under the direction of Chris Barletta. Further details about the event will be posted once the piece is actually written! Check back soon for more info. This event has been replaced by the Premier of Faith Is Like a Mystic Spirit. God, Your Golden Doorway Beckons will be premiered on May 30 (in unison) at the Graduation Mass for Holy Redeemer Catholic School. More information about that event is available here. The Bel Canto Choir of Gateway High School under the direction of Chris Barletta will give the premiere performance of The Chariot by Wm. Glenn Osborne during their spring concert on Monday, May 5, 2014 at 7 pm. The concert will be repeated on Tuesday, May 6 at 7 pm. Wm. Glenn Osborne will guest conduct the first performance on Monday. Tickets are $5. A video of this first performance can now be seen here. Wm. 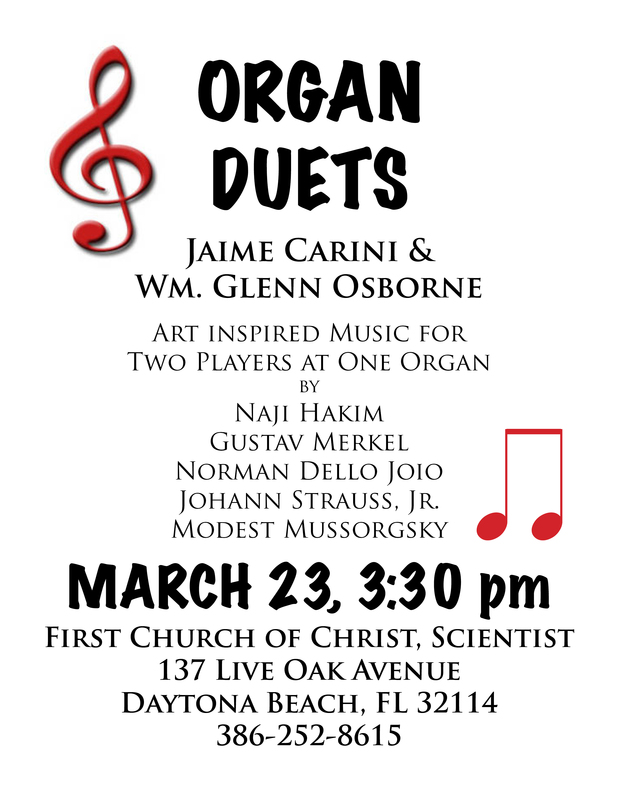 Glenn Osborne and Jaime Carini will present a concert of organ duets at First Church of Christ, Scientist in Daytona Beach. Included on the program will be works of Gustav Merkel, Johann Strauss Jr., Modest Mussorgsky, and others. The program will feature the US premier of The Apostles by Naji Hakim. Wm. Glenn Osborne and Jaime Carini will present a concert of organ duets as part of the celebration of the 50th anniversary of the installation of the organ at All Saints Episcopal Church in Winter Park, FL. Included on the program will be works of Gustav Merkel, Johann Strauss Jr., Modest Mussorgsky, and others. The program will feature the US premier of The Apostles by Naji Hakim. The complete program is available here.